Application: Series 1, 2 & 3 four cylinder engines. 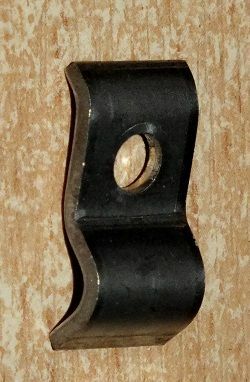 Description: Square flange gasket for exhaust. Used on various exhaust manifolds and on some pipe to pipe exhaust joints. Application: Series 1 1.6ltr & 2.0Ltr and Series 2A/3 2.6ltr petrol engines. Description: Thick rubber sealing ring between water pump and cylinder head. Application: Series 1, Series 2, Series 2A and Series 3 4 & 6 cylinder models. 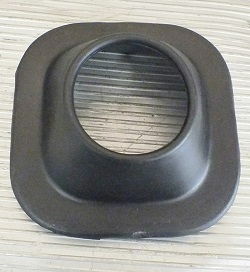 Description: Reproduction rubber gaiter for main gear lever. Approximare dimensions: 11.5cm(4.5") square, 3.6cm(1.4") high. 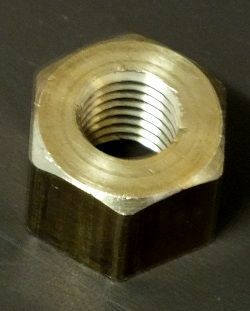 Description: Brass nut 5/16"BSF for holding downpipe to exhaust manifold. Approximate dimensions: 3/8"(9.5mm) high, 17/32"(13.5mm) across flats. Application: Series 1 1954 onwards, Series 2 and 3 short wheel base models. Description: Replacement rear shock absorber by Armstrong. Approximate dimensions: Overall length closed 36.2cm(14.3"), overall length open 55.5cm(21.9"). Application: Series 1 front axles, Series 2 & Series 3 to 1980. 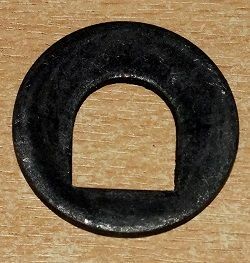 Description: Inner hub oil seal made by Corteco/Gaco. Approximate dimensions: outside diameter 85mm (3.35"), thickness 7.8mm (0.3"). Application: Series 1 1600cc engine 1948 to 1953. Application: Rover type differentials on Series 1, 2 & 3. Range Rover Classic, Defender and Discovery 1. 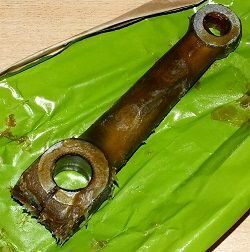 Description: replacement gasket for differential assembly to axle casing. Application: Discovery 3/4, Range Rover Sport and Range Rover 3 (L322). 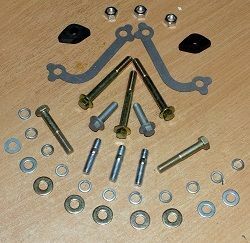 Description: Kit of 11 tools for removing and replacing front and rear wheel hubs. This job includes every part of the process from picking up the phone at the start of a sale to sending the courier off with the box and checking it got there safely! Please apply with your CV by email to Dawn on accounts@dingocroft.co.uk or call 01494 448367 asking for Debbie or Tim. Haven't found what you want? Then try our quotation service. Application: Series 1 models 1948 to 1956 approx. Description: Drop arm for early type steering box. This arm is held in place with a pinch bolt. 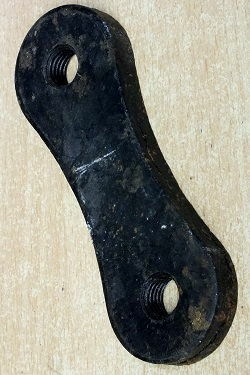 Description: 'D' washer for support shaft for brake and clutch pedals. Approximate dimensions: Outside diameter 38mm(1.5"), thickness 3mm(1/8"). Application: Series 3 from 1980 with 2.25 litre petrol engine. Application: Series 2 and Series 3 to approx 1980 with 2.25 litre petrol engine. Application: Series1 1948 to 1953. 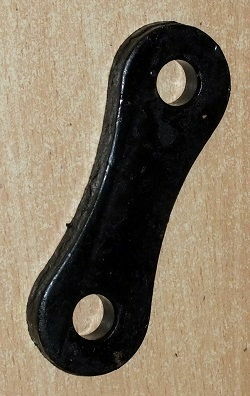 Description: Shackle plate for rear springs with plain 9/16" diameter holes. Application: Series 1 1948 to 1953. 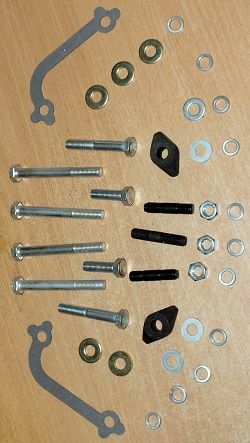 Description: Shackle plate for rear springs with 1/2"BSF threaded holes. Application: Series1, Series2/2A and Series3 models. Description: Reproduction stainless steel clip for brake pipes. Intended for 3/16" pipe, but will work with 1/4" diameter pipe also. Approximate dimensions: Length 20mm(0.8"), width 10mm(3/8"), height 5mm(0.2"), hole diameter 4mm(0.16"). Application: Series 1 petrol models 1948 to 1958, Series 2 models with 2 litre petrol engine. 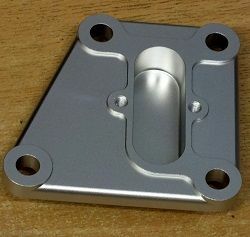 Description: Reproduction end plate in cast aluminium with mounting aperature for thermo switch.